When it comes to summertime drinking in NYC, you've got plenty of options -- especially now that the whole drinking in public thing won’t land you in jail. But if you're tired of beer gardens and rooftops (how dare you! 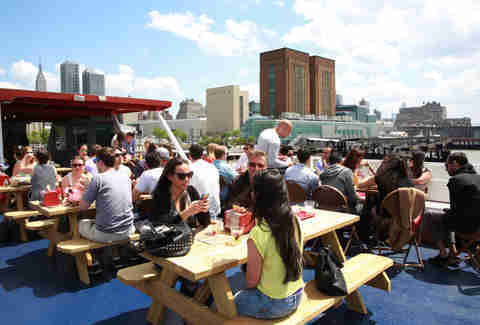 ), the best way to booze alfresco is on a boat. 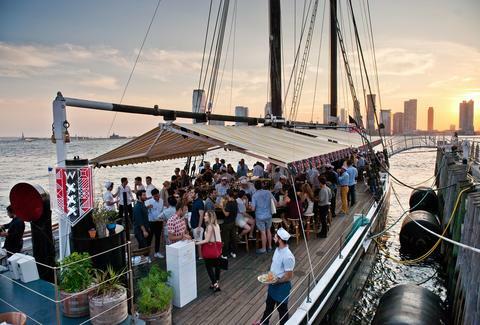 Set your sea-sickness aside and hop on board -- we've rounded up every boat you can drink on in NYC right here, in one tidy, ready-to-drink list. This historic, hand-built fishing schooner is now a much-hyped oyster bar in Tribeca, with a sustainable menu featuring soft-shell crabs, lobster rolls, and of course, lots of oysters. Reservations are recommended for dining, but you can easily snag a seat at one of the two on-deck bars serving up refreshing cocktails, wine, Champagne, and craft beer. Bar Director Lauren Schell (previously of Milk & Honey) is doing inventive drinks and subtle twists on classics, like the Wild's Negroni with gin, Campari, sweet vermouth, and muddled orange and strawberry. This floating lobster shack is perfect if you want a totally unpretentious atmosphere for drinking and eating out on the water. 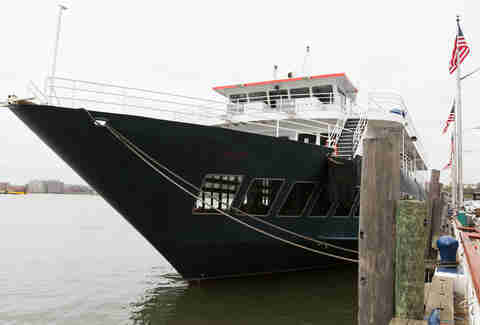 North River’s 45-minute cruises offer actually great seafood -- like fried wonton shrimp rolls, fish and chips, and four different varieties of lobster rolls -- as well as a solid bar menu with Mason-jar cocktails, beer buckets, and an ample selection of wine. Two massive sailboats -- one 82ft, the other 158ft -- sail at various times throughout the week, making this a convenient option whether you want a full-blown meal or a simple cash bar (there are options for both). Manhattan by Sail also offers a number of special sails, like the Lobster & Beer Lovers Sail (which gets you two lobster rolls from Luke’s Lobster and unlimited beer), a Craft Beer Tasting Sail, a Champagne Brunch Sail, and more. 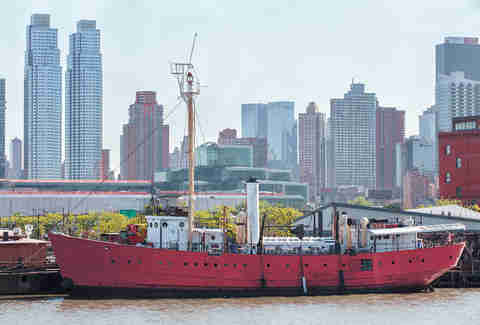 The King of NYC boats is still the rowdiest spot to grab a bucket of beer and a lobster roll, but its backstory is not nearly as known -- the infamous lightship sank while docked in Maryland and remained underwater for over three years before being salvaged and restored into the boating-bar mecca it is today. A celebration of New England food culture, this historic WWII ship specializes in sunset cruises from Greenpoint to Lady Liberty. The menu includes a three-course dinner with New England classics like lobster corn chowder and mixed-fish seafood boil, and you can wash it all down with a vast selection of craft brews and nautical-inspired cocktails like The Captain’s Widow (gin & tonic with lavender bitters), plus beer, wine, and a decent selection of rum. The sister bar to North River Lobster Company, this three-story seafood restaurant/lounge on a docked 160ft yacht is a bit more done-up than the rest, with the price-point to match. But while sails may be on the expensive side, the space is meticulously furnished, and boasts a menu including black truffle burrata, Plymouth Rock oysters, 26 different Champagnes, and craft cocktails like the Ibiza Sunrise with Grey Goose, orange, cranberry, and passion fruit. It's not quite a boat, but this floating clubhouse gets the job done. Situated in the middle of New York Harbor, this classy barge -- an offshoot of the Manhattan Yacht Club -- offers unobstructed skyline views, a full cash bar, small bites, and tons of breezy charm. 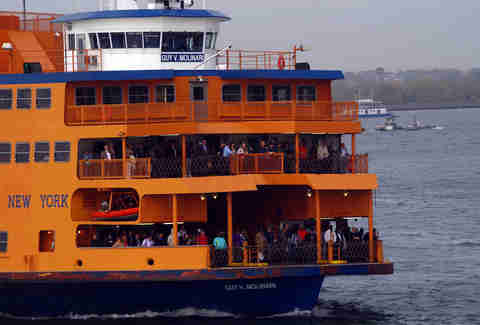 Arguably the best boat to drink on in the city, the incomparable Staten Island Ferry will change everything you think and feel about New York's most ignored borough. For starters, the ride is totally free, and for 30 blissful minutes (or an hour, if you just want to ride it there and back -- you do you), you can take in the views while taking down tall boy after tall boy. Is there anything better than that? Christine Fischer is a freelance writer for Thrillist who will take any excuse to drink rosé on the water. Follow her on her website, Facebook, or Instagram.